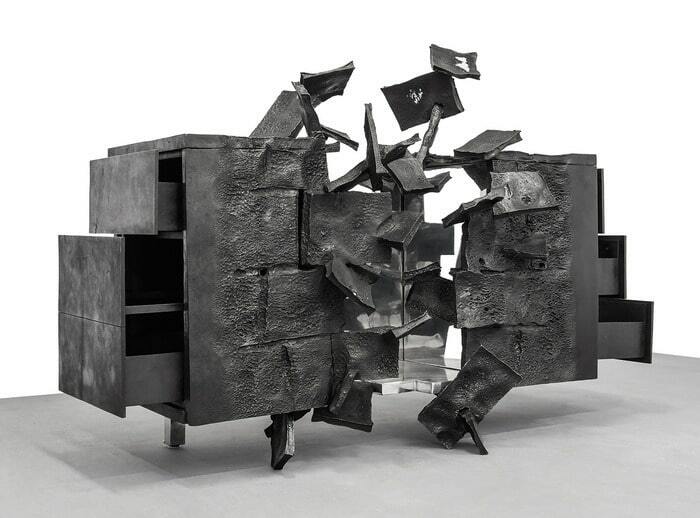 This new desire for artistic eye-catchers explains why sculptor Vincent Dubourg’s cabinets met with such acclaim during a recent solo show at Carpenters Workshop Gallery in Paris. 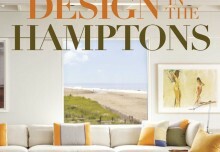 His wildly subversive “deconstructed” designs are infused with an energy that seemingly captures a moment of explosion. Yet designs such as the yellow-tinted Bhanga Bronze (from about £131,000), aluminium Inner Vortex (from about £91,000) and Insideer Alu (from £65,000; all in editions of eight) are surprisingly functional. 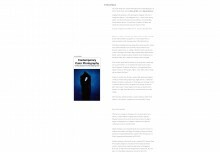 “People want to integrate art into daily living, and Dubourg stretches the boundaries of an object. You can sense the pace and power involved in its creation,” says Loïc Le Gaillard, co-founder of Carpenters Workshop Gallery. The unveiling of a blackened-steel and bronze console ($60,000), created by Pennsylvania-based sculptor Gary Magakis, at San Francisco’s Fog Design + Art show in January met a similar chorus of approval. 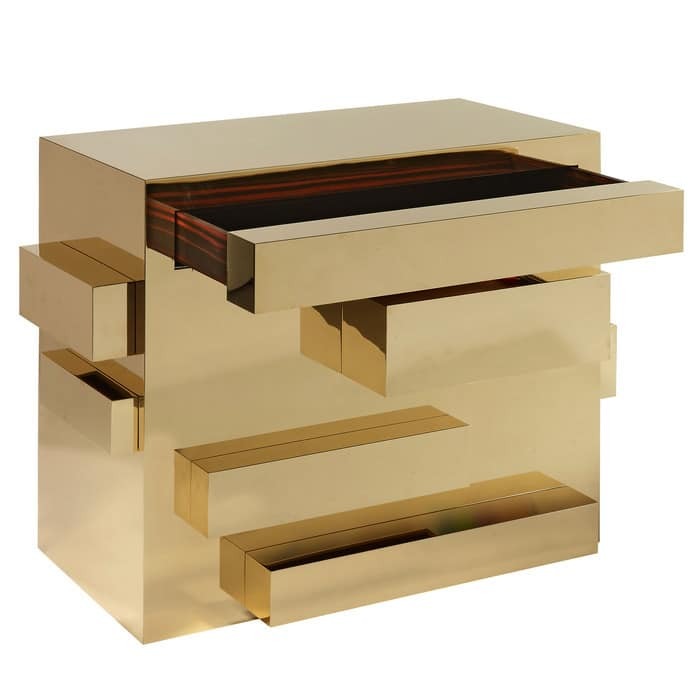 Inspired by the constructivist movement and architect Frank Lloyd Wright’s cantilevered rooms, this bold yet graceful design comprises six sections – three in solid bronze, three in solid steel – with cantilevered end cabinets that give the impression that the five‑door console is floating. Exclusive to Todd Merrill Studio Contemporary, it’s the first in a storage series designed to be experienced from every angle like a freestanding sculpture. 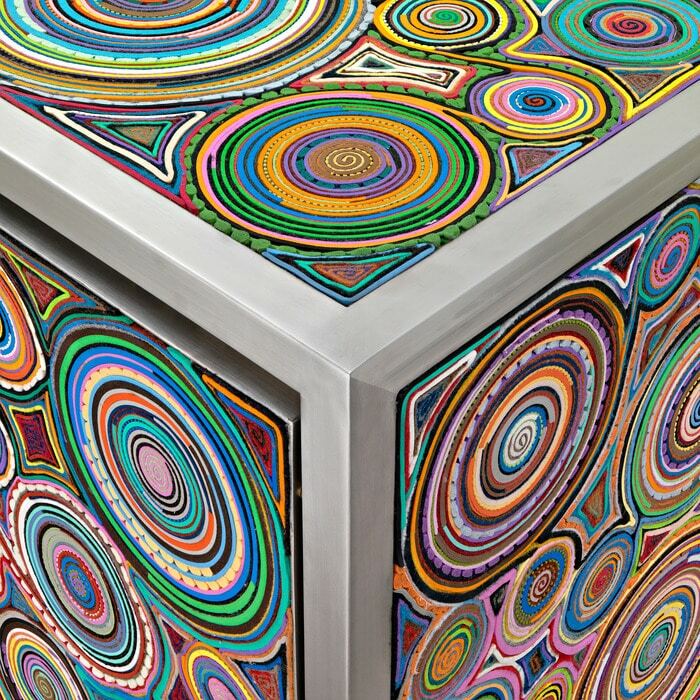 “Collectors are gravitating towards three-dimensional sculptural pieces, whether in furniture or fine art,” says Todd Merrill. “My metal fabrication techniques are the same as those used by Pablo Picasso, Anthony Caro and David Smith; the most important thing I’ve learnt from great artists is to look inward when I design,” says Magakis. In contrast, Tina Roeder – a Design Academy Eindhoven graduate – gazed outside her Berlin studio for inspiration. The elaborate architecture of Karl-Marx-Allee, a Soviet-era boulevard in former East Berlin, was originally built to demonstrate the working man’s social utopia. Roeder’s Constructive cabinet (£24,000; edition of three) reworks it in a humble building material: laser-cut anodised aluminium. 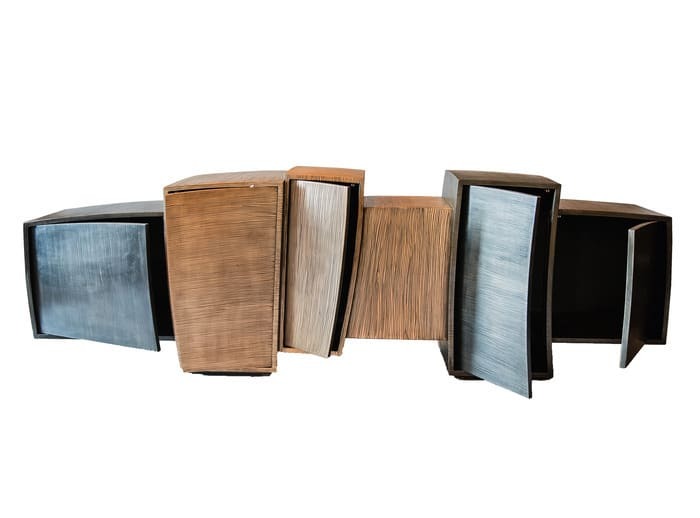 Similarly, brutalist Brazilian architecture is referenced in the Burle cabinet (€20,500) from Oitoemponto’s limited-edition Nossabossanova furniture collection. Designed by Portugal-based Artur Miranda and Jacques Bec, the African teak and lacquer cabinet pays homage to modernist landscape architect Roberto Burle Marx, with a wave pattern echoing Rio de Janeiro’s pavements. 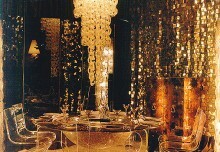 Harnessing architectural influences to glamorous effect is Parisian designer Christophe Côme’s forte. 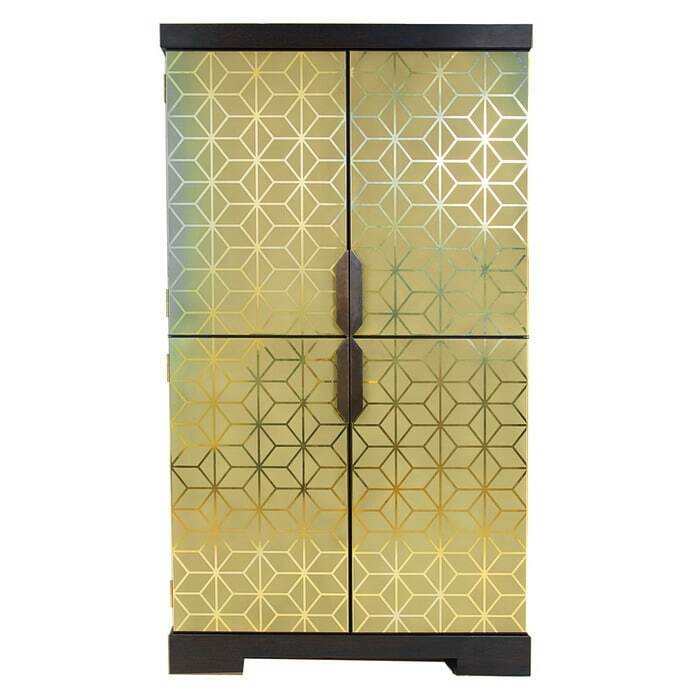 His Triscota cabinet ($80,000) combines wrought iron with cast ripple glass, while raw – yet appealing – smokily coloured glazed lava tiles give his Lava cabinets ($70,000 each) their artistic edge. 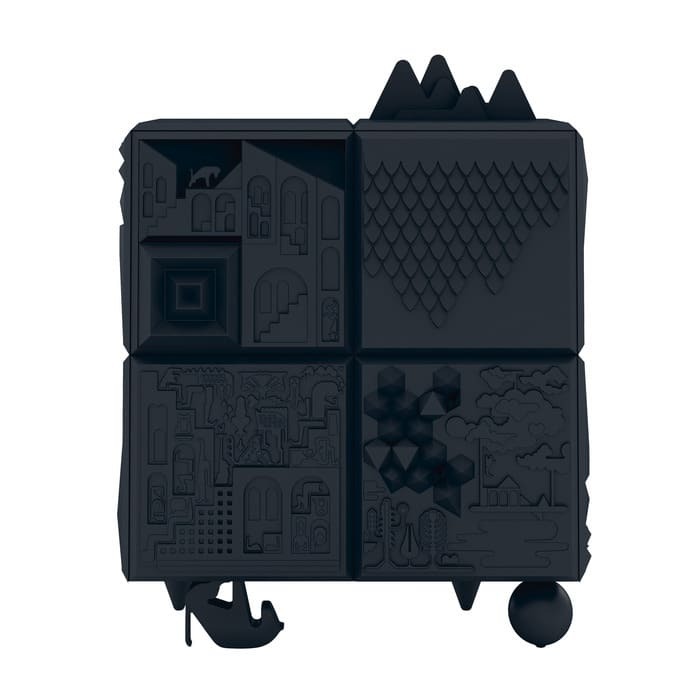 Meanwhile, porcelain tiles portraying abstract photo collages of construction sites decorate the tubular steel-framed Chiaroscuro cabinet ($28,000) by Paraguay-based architect Pedro Barrail. “It’s so exciting that designers are radically rethinking the idea of storage,” says Cristina Grajales, owner of her eponymous New York gallery. “They’re creating something practical but also sculptural. 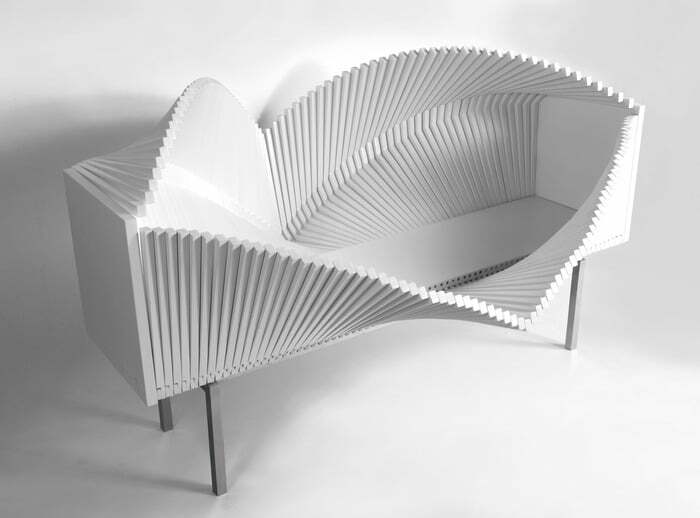 In the hands of an artist like Sebastian Errazuriz there’s an element of playful human engagement too.” Grajales cites Errazuriz’s Wave cabinet ($72,000, edition of eight), whose slatted lacquered birch façades can be configured by users into various artful shapes. Just as intriguing is his lacquered maple Samurai cabinet ($70,000; edition of eight); slatted sides and top provide access as if it’s a magician’s box. His Magistral chest ($80,000; edition of eight) – decorated with 20,000 outward-facing bamboo skewers – offers a commentary on securing personal possessions. While Errazuriz’s storage solutions embrace a futuristic, experimental approach, other designers engage in a historical dialogue while rooting their creations firmly in the present. Cubism’s significance as an art and architectural movement is a particular inspiration for contemporary furniture designers. And in one case, this benign influence has come full circle, with Glasgow-based Chris Turner’s Cubist credenza (£3,900) featuring in Iain Faulkner’s series of paintings A Different Time. The artist bought Turner’s first credenza following its launch at the Scottish Furniture Makers Association’s annual exhibition in 2013 and, relishing its geometric patterns, portrayed it in two paintings shown at London’s Albemarle Gallery last year. 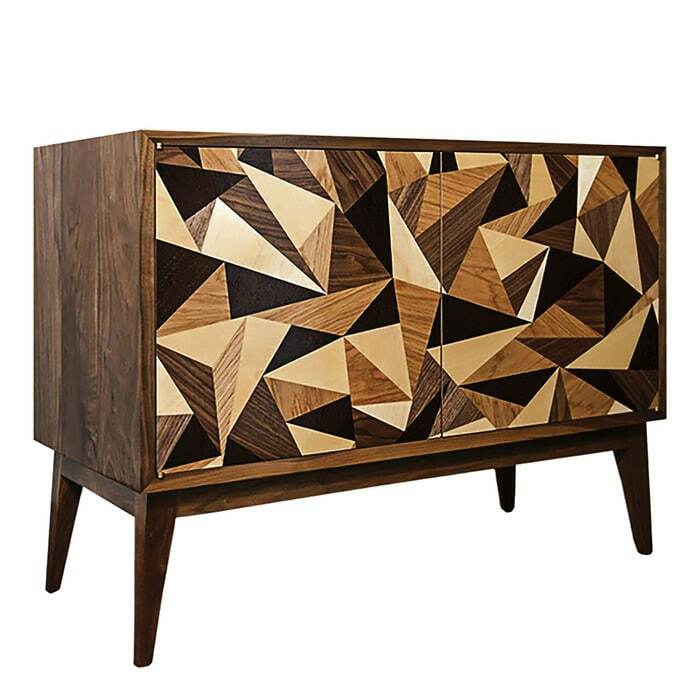 Inspired by Picasso and Braque, the Turner Furniture founder uses traditional parquetry skills to create an abstract pattern of wenge, oak, maple and walnut veneers on the cabinet’s solid American walnut doors. Handmade to order, the credenza is available via Treniq, an online platform launched last autumn by Sheetal Sachdev and Nitesh Thadani, whose careful selection of furniture and home accessories champions handcraftsmanship. Further stylistic echoes of cubism are luxuriously employed by Swiss-born, Paris-based designer Mattia Bonetti. Tresor (€85,000; edition of eight), a two-door cabinet embellished with copper and gilded brass on a eucalyptus and birch veneer, brings to mind the work of artist Piet Mondrian. Strata (£114,000; edition of eight) gleams with an abstract mélange of geometric stainless-steel panels, while the polished brass Monolith (£72,000; edition of eight) contains macassar ebony-lined drawers on three sides. “I could add another on the fourth side, so it could sit centrally in a room,” says Bonetti. For the owner of a contemporary apartment in Gstaad, however, he created two cabinets for opposite corners of a media room. One holds DVDs and audio equipment, the other is a bar with a concealed fridge. Both exteriors are clad in parchment. “I chose this material because I wanted to create gentle lines and soft colours; it was often used for furniture in the 1930s and gives the pieces an art deco look,” says Bonetti. 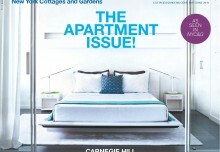 Art deco design cues – motifs as well as materials – are evident in much contemporary storage. 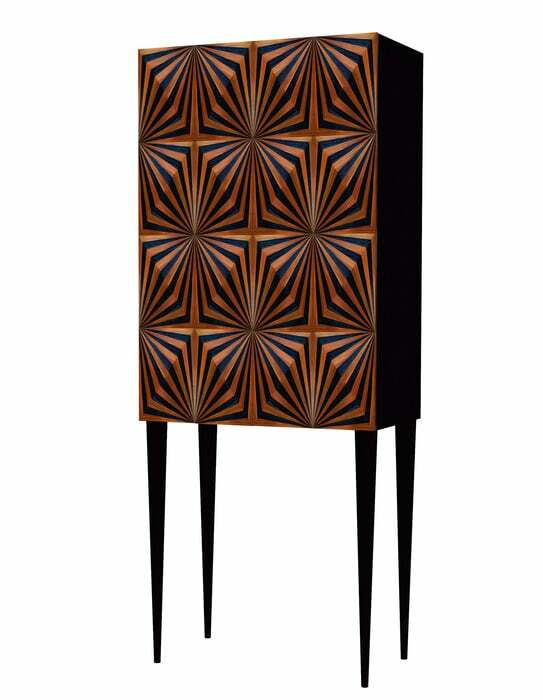 The new Josephine cabinet (£1,995) from Andrew Martin features a sunrise impression in a gunmetal-on-wood finish, while furniture maker Jonathan Baring’s black ebony cabinet (£17,400), commissioned for a French château’s master bedroom, was given a dramatic flourish in vellum marquetry – using a technique and material popular in the early 20th century. Suffolk-based designer Kate Noakes employs geometric patterns of metal inlaid with black gesso to contemporise the art deco look of her Stripe cabinet (£2,500) and Button Up sideboard (£2,200). 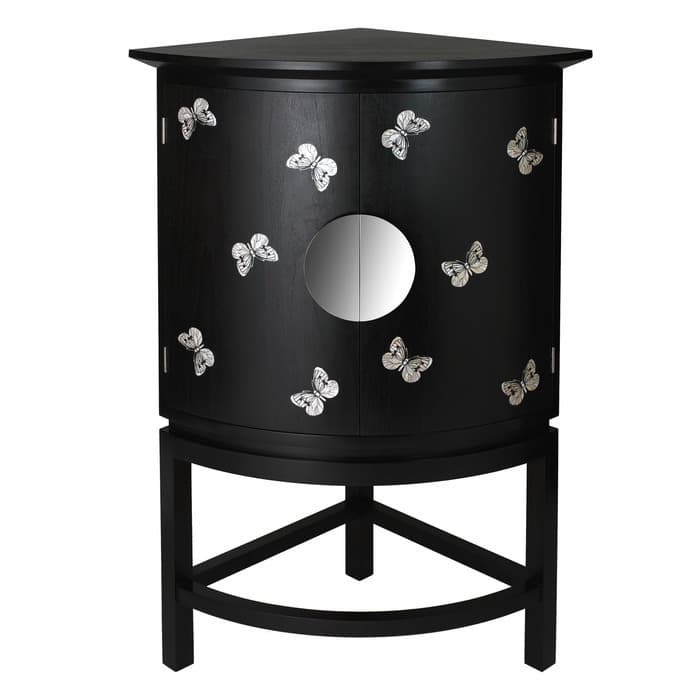 And Rupert Bevan has decorated an American black walnut corner cabinet (from £11,400) with marquetry butterflies inlaid with mother-of-pearl. “It was inspired by a traditional Japanese lacquered cabinet and has aspects of art deco and echoes of Emile-Jacques Ruhlmann in the ebonised, lacquered timber and mother-of-pearl – a blending, if you like, of eastern and European principles of design and decoration,” says Bevan. 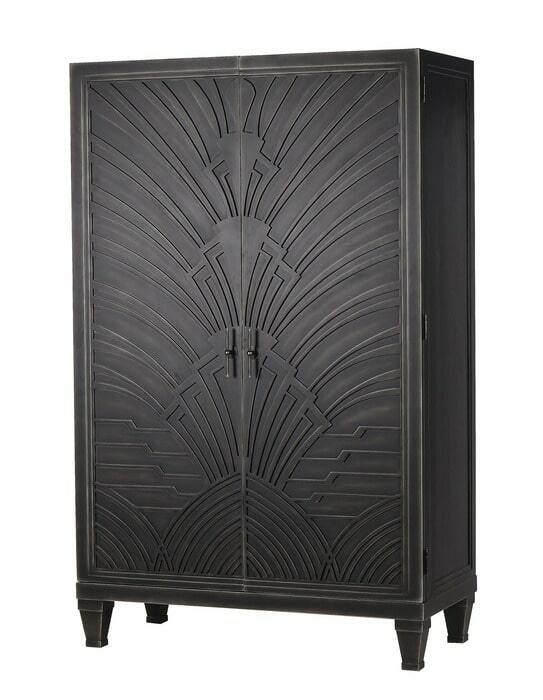 As a visual evocation of the Jazz Age, Bevan’s Geometric Etched cocktail cabinet (from £28,800) would have suited Jay Gatsby’s fictional mansion perfectly. Its brass-panelled exterior is decorated with a geometric pattern – chosen from a traditional Japanese woodblock print – while the stained-walnut interior contains a mirrored bar area with lighting, wine rack, fitted fridge and freezer. “We wanted to celebrate the glitz and glamour of the 1920s cocktail-party era, so art deco was a big inspiration,” says Bevan. 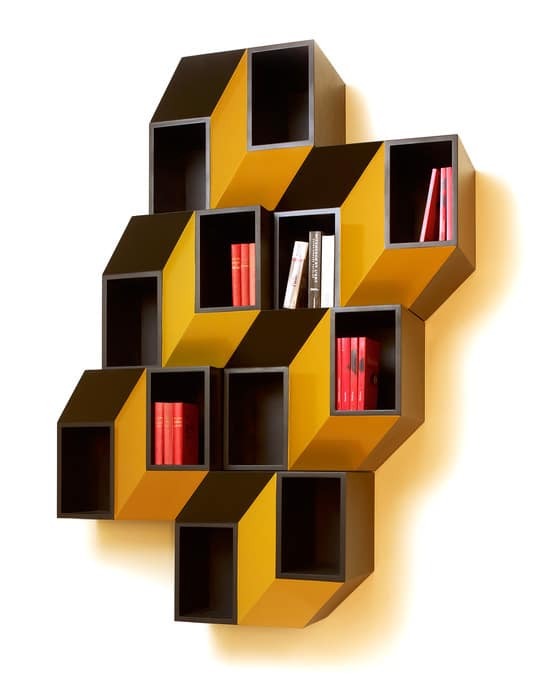 A very different style – op art – characterises Beirut-born Charles Kalpakian’s Kineticism wall cabinets (€25,200; each in an edition of eight). Custom coloured in lacquered Corian, they cleverly echo the optical illusions created by artists such as Bridget Riley in the 1960s. “They’re like functional paintings, visually referencing kinetic art and op art and flirting with the spirit of Victor Vasarely,” says Béatrice Saint-Laurent, director of Galerie BSL, which represents Kalpakian. Hypnotic patterns are also conjured by the intricate straw-marquetry veneer on London-based designer Violeta Galan’s OpArt drinks cabinet (£14,900). “Op art creates an illusion of volume and, used in different patterns and colours, straw can create an almost 3D effect on furniture,” she says. Others are instilling contemporary storage with the essence of their own favourite artists. Andy Warhol’s Flowers series is echoed in the metal and red gesso decoration of Kate Noakes’ Poppy cabinet (£3,000). And one homeowner commissioned Dublin-based design duo Susan Zelouf and Michael Bell to translate her love of Mark Rothko’s paintings and Japanese motifs into the exotic Kimono cabinet (€83,500), whose dramatically deep tones were achieved with car paint. Meanwhile, Sean Scully, the Dublin-born, New York-based artist and Turner Prize nominee, inspired Zelouf+Bell’s Scullied drinks cabinet (€11,370). Its painterly façade references Scully’s abstract Wall of Light series, employing a palette of dyed wood veneers in various depths to mirror his thickly layered paints. Exploring further synergies with contemporary art, Zelouf+Bell integrated a back-lit stained-glass panel portraying a black and white skyline by artist Peadar Lamb (a descendant of pre-Raphaelite Ford Madox Brown) within the elegantly curved, wall-mounted Nighttown cabinet ($20,960). Just as abstract art embraces bold graphics, so does storage. Parisian graphic designers Antoine Audiau and Manuel Warosz (Antoine+Manuel) gave BD Barcelona Design’s Tout Va Bien cabinet (€7,420) an intriguing relief pattern of hieroglyphics and contemporary graphics. And the eye-catching Lala Surma drinks cabinet ($14,000) caused quite a stir at Design Miami last December. Designed by Johannesburg-based Dokter and Misses – husband and wife duo Adriaan Hugo and Katy Taplin – its decoration is inspired by the body painting of indigenous nomadic Ethiopian tribe, the Surma. “The cabinet’s raw steel ‘canvas’ acts as the ‘skin’ onto which expressive cultural strokes are applied using natural pigments such as red ochre,” says Hugo. “Art and design become interesting when there’s a story – an emotional journey – behind the pieces,” says Carpenters Workshop Gallery’s Le Gaillard. This observation is glamorously demonstrated by the Kundan mirror cabinet (£45,000; edition of eight) designed by Nipa Doshi and Jonathan Levien for Galerie Kreo. Its rhythmic decoration of geometric motifs and tiny inlaid mirrors was inspired by embellishments on the mud-constructed interiors of nomadic houses in Kutch, western India. 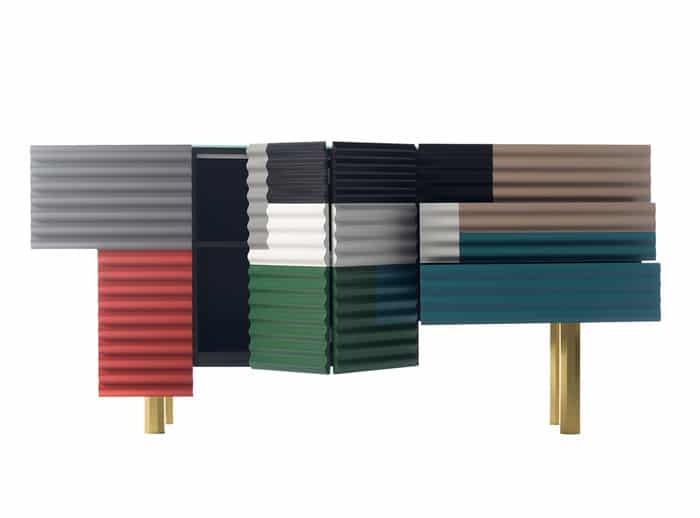 An equally irresistible narrative is found in Doshi Levien’s asymmetric Shanty cabinet (€7,507) for BD Barcelona Design, which captures the patchwork of colourful corrugated surfaces used in improvised dwellings (it’s actually made from lacquered MDF). With each door opening in a different way, the haphazard nature of this unconventional cabinet belies a rational approach to storage. While Shanty appears to emulate reused refuse, the Sushi cabinet (from £62,000; edition of eight), designed by Fernando and Humberto Campana of Estudio Campana, employs excess materials from manufacturing to replicate the mash-up of favelas in their native Brazil (a conceptual favour repaid by the brothers’ direct involvement in these communities) and reflects the bold palette of contemporary abstract art. Storage, it seems, is no longer just a hideaway, but an artwork in its own right.